One of the deepest craters in Mars' Tagus Valles region lies in the foreground of this perspective view. Numerous landslides have occurred within this crater, leaving grooves in the wall as material slumped to the floor below. Powerful landslides may rumble down Martian slopes at up to 450 mph (725 km/h), sped along by slippery ice, a new study suggests. Researchers Fabio Vittorio De Blasio and Giovanni Battista Crosta, both of the University of Milano-Bicocca in Italy, modeled the dynamics of landslides on Mars, especially those inside Valles Marineris, the gigantic canyon system near the Red Planet's equator. The duo found that ice — at the landslides' bases and/or spread widely throughout the Martian soil — is likely a key player in these dramatic flows of Red Planet rock and dirt. "Only if the presence of ice is included in the calculations do results reproduce reasonably well both the vertical collapse of landslide material in the scarp area, and the extreme thinning and runout in the distal area, which are evident characteristics of large landslides in Valles Marineris," they wrote in the new study, which was published this month in The European Physical Journal Plus. This conclusion fits with other available evidence, the researchers added. 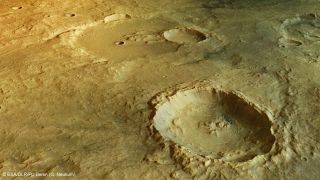 For example, Valles Marineris landslides look a lot like landslides here on Earth that fall onto glaciers, they wrote. And then there's the Martian landslides' speed. New caption: Mars' gigantic Valles Marineris canyon system dominates in this mosaic of images taken by NASA's Viking 1 orbiter. "The calculated velocity of landslides (often well in excess of 100 m/s and up to 200 m/s at peak) compares well with velocity estimates based on the run-up of the landslides on mounds," the researchers wrote. "We conclude that ice may have been an important medium of lubrication of landslides on Mars, even in equatorial areas like Valles Marineris." One hundred meters per second is about 225 mph (362 km/h), and 200 meters per second is roughly 450 mph (725 km/h). To put that into perspective, the superfast "pyroclastic flows" that barrel down volcanic slopes during eruptions here on Earth top out at about 150 mph (240 km/h), according to the U.S. Geological Survey. And most terrestrial landslides are much slower than that.